OK first noob question here ... how do i unplug the battery again? It's really stuck in there, do i just yank harder ? Or do i need to put pressure on the sides or something? Personally, I shake it a little bit when yanking it. When then battery connector is new, it need a "lot" of force to unplug it. With tweezers/pliers or just with your hands? I would recommend tweezers or pliers to grab onto the plastic plug. You don't want to pull on the wires themselves. In the build document, I believe there is a section that discusses shaving the nubs, so it's not as hard to remove the plug in the future. Probably too small for electrical tape, right? 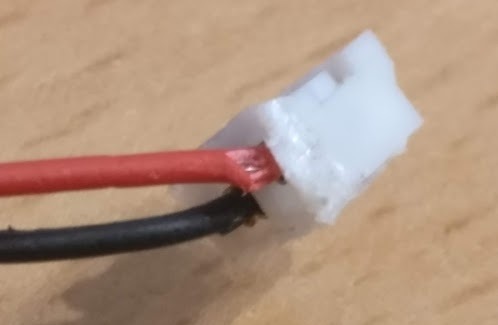 Use dielectric grease or perhaps best to just get a new JST connector? You could post a photo, but it would probably be very hard to tell if it's a problem or not. You just don't want the battery wires to touch anything else. I would think that electrical tape might work, because I think you'd still have room to fit it in. That probably depends on exactly where the damage is. Heat shrink tubing could also be a good idea. Will heat shrink tubing work so close to the connector? First of all, I want to be clear that I am not recommending that you do anything in particular. Lithium batteries can be dangerous, and the proper safe way to proceed is to properly dispose of the battery and purchase a replacement. Please do not take the following text as a recommendation of what I think you should do. I am telling you that you should not mess with Lithium batteries. I am not telling you to do this. If that were my battery, I would probably decide that the tiny bit of exposed wire is in a place that realistically wouldn't touch anything. Then, I might put a bit of superglue on it, just to be certain that it wouldn't touch anything else. Another thing I might consider doing myself is to pull the pin out of the plastic housing, slide on a small heat-shrink tube, place the pin back into the housing, and then shrink the tube. In fact, working with the wire like that, could cause further damage, but I feel confident that I could do it without damage. We can provide no warranty and we will take no responsibility if you decide to modify your battery. 2. Before you put your build together, plug the battery in and unplug it like 10 times. 3. If it is hard to pull out, I used my cutters to pull out the plug. Obviously don’t squeeze, but just use them for leverage. This doesn’t work well once everything is put together.